- Create a sand path straight ahead to cross to the midpoint of the room. Get on the raised floor, create another sand path along the northern strip of sand, and merge with it to access the chest to your right. It contains five rupees. Swank. Remain merged and twist around the sand to reach the door in the north. - Run to the stairs in the north and make your way down the east side of the next room. A green statue ahead will fire a beam at you when you come close; merge with the wall behind it to get by, sneaking towards the doorway in the south. - Walk north until you come to a pit of sand surrounding four pedestals, each bearing an orb. Sand Rod your way to the east side of the room until you're positioned between the pedestals, then create a sand path that runs through them. Rush over the path and hit all four before they deactivate to open the cage to the south. - Use the Sand Rod to create a barrier between yourself and the two green statues blocking the way into the next room as you head further south. - There are three gargoyle statues in the next room, as well as three pressure plates to put them on. Drag the statue already on the top level into place, then use the Sand Rod to get the other two up to the top level. In one case you need only create a path to the gargoyle and drag it across; in the other you'll have to push it into line with a prong in the path above and create a sand path beneath it. Putting all three in place opens a door. - Create a sand path through the next room, to the west. - The next room will lock down and force you into a fight with a creature that lives beneath the sand. target its head with the Sand Rod to force it out, then chop at its bits with your sword. - Run through the northern door. There are monsters aplenty in this room. Start by fighting your way north and onto higher ground, then make your way back south. Use your Sand Rod to create a path to the chest on your left; merge with the sand to get across. The chest contains a Monster Tail. Return to the opposite side, run to the northern end of the sand, and create another path that'll allow you to access the doorway in the north. - In the next room, check the chest for a Compass. Pull the switch here to dump sand into the previous room, allowing you to get a chest containing a Small Key. Use it on the door in the southeast corner of the room. - Run north in the next room to find another switch. It will fill this room with sand as well. Use the Sand Rod to get to the platform in the north where a button awaits, then merge with the wall to the left and behind the button to get at the big chest the button opened up. Inside it is the Titan's Mitt, which will allow you to heft even heavier rocks. - Make your way back to the room with the treasure chest on your map. Use the Sand Rod to cross down to the chest, and the Mitt to pick up the rocks blocking it off. Inside is a Small Key. Use it on the door in this room, then run south through the next passage to get outside. - Curve around the leering structures to access the third door in and out of this dungeon, set into the rear wall. - Inside you'll be faced by flying tiles. Block until they expend themselves on your shield, then attack the sandlion creatures that appear afterward. Kill them both to create a path to a transport square that will take you back to the entrance. - The path splits in two, here; we'll start in the east. Use the Sand Rod to create a path leading to the north wall, merge with it, and travel to the door on your right. Make your way north throguh the next sand-filled room. - Head south through the traps in the next room and hit the blue orb switch you find - once you're standing on the red flooring, that is - to raise yourself to a higher level. Move to the center of the room and use the Sand Rod to raise the gargoyle statue that's being pelted with arrows up to your level. Pull it off of the sand so the arrow trap will hit the orb switch instead. Use its constant raising and lowering to move up the red and blue walls in the bottom-right corner of the room. They'll take you to a Small Key chest. Use the blue-and-red platforms in the north to go, well, further north. - Go down the stairs in the next room and lift up the rock. Beneath is a hidden chest containing 100 rupees; you'll have to free it with the Sand Rod. Run east and, after killing the enemies, use the Sand Rod to create a path for a giant ball to roll into the yellow block above. Use the newly-created walkway to climb further north, where you'll have to use the Sand Rod to create a path for a ball three times. 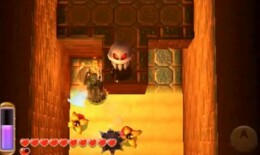 This will open up a stream of sand, allowing you to get at the big chest in the previous room containing the Big Key. - Before leaving this area, check the south wall of the room with the balls. There's a hidden passage leading to a rock. The rock hides a chest containing 100 rupees. - Go through the door to your right. Use the Sand Rod on the sand under the green statue to move it out of the way, then merge with the sand to get at the chest on the other side of the room. It contains 100 rupees. - Return to the previous hall and go through the left door. Kill the enemies in the south and head north. Activate the green statue between the four pedestals with darkened orbs and wait for it to hit all three of them. This will open a door in the south. - Enemies inside. Kill! Kill! Wipe 'em all out for a Small Key. - Return to the previous room and head to the north end. Use the same trick you used on the previous statue with this one. It will raise and lower the red and blue platforms nearby, allowing you to merge with the wall and get to the locked door. - Check behind the sandfall in the next room for a chest containing 100 rupees. - Run south two rooms. Use the Sand Rod to bridge the west side of the room with the east, lining up the path with the stone gargoyles. Kill them one at a time, then make your way across to the chest with the Small Key. - Return to the previous corridor and go east. In the next room you'll find those Bomby creatures that, when hit, turn INTO Bombs. Use either them or your own Bombs to destroy the yellow blocks in this room and collect rupees. After splurging, use the Sand Rod to raise Bombs up that will destroy the yellow blocks on the pedestals. This will allow the arrow trap to hit the orb switch on the far side of the room, creating a path for you to get up to the door in the southwest. A horrific plant living in a sandy swamp? Okay, we'll work with it. The biggest problem with this fight is getting to the plant in the first place. Use the Sand Rod to create pathways you can traverse to platforms which will, hopefully, be near its body. Once you're close enough, either swipe at it with your sword or use a Bow / Rod to hit it from afar. I prefer the Bow as you can get in more strikes, but it's up to you. Do enough damage and the thing will begin releasing weird, flying spores that will harass you as you try and move around. Your strategy won't change, much, as you're still just trying to swipe at its body. Do what you must to get at it, killing its spores whenever they get too close. The number of spores increases the more damage you do to the main monster. In the final phase the monster will charge up and use a long-range beam attack, moving in a slow circle. Once this happens, try to position yourself so you're hitting it from behind. This beam is really good at knocking you into the sand below, which will do a bit of damage and stall your offensive for a few seconds. Nor terribly dangerous, but tricky. After killing the thing, the area will be filled with traversable sand. Use it to get at a Heart Container - and a portrait of Sage Irene. That's three!